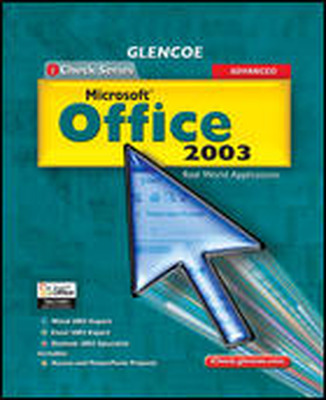 iCheck Series: Microsoft Office 2003 — Advanced is the second of this two-volume series. This advanced book covers Microsoft Office Expert objectives for Word 2003 and Excel 2003, and Specialist objectives for Outlook 2003.
iCheck Series: Microsoft Office 2003 — Advanced is the second of this two-volume series. This advanced book covers Microsoft Office Expert objectives for Word 2003 and Excel 2003, and Specialist objectives for Outlook 2003. Unit 4 focuses on integrating all four main applications: Word, Excel, Access, and PowerPoint. An Annotated Teacher’s Edition provides point of use instruction and helpful teaching strategies for all student skill levels. iCheck Series: Microsoft Office 2003 — Advanced was written specifically for high school students. It is age-level and interest-level appropriate. The student edition also integrates basic language arts and mathematics skills.